and I found a lump that turned out to be breast cancer. And then I beat it! August 17th, 2015 changed my life. Because on that day, I caught cancer early. to do your self breast exams. It is my sincere hope that you and your sistahs will find nothing each month. But if you do, catching it in the early stages can absolutely save your life. the theme of this month's hop. I would love to have you join us for future hops! There will be info on how to do that at the end of this post as well as on Heather's blog-the last stop. Here is the list of amazing sistahs who have fabulous eye candy to share with you today. Be sure to leave them a little love as you hop through. to a few lucky random commenters. 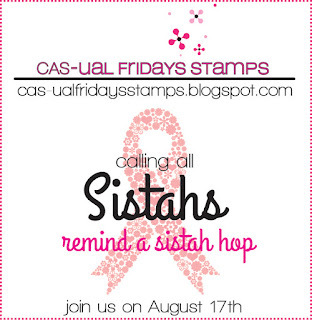 Please join us on our Calling All Sistahs facebook page for more info on how to join this hop. and it's ok if you've never been part of a hop before. We make it as easy and friendly as possible. All you need is a blog and 1 item from our Calling All Sistahs collection. either as a hopper, or a hop stop. Breast Cancer runs in my family on both sides. so I am always having to have mine checked at last every 6 months. I am so happy to hear that you beat it. What a wonderful and amazing reason to have an hop!! Really love your initiative and I'm thrilled to be part of the hop this month! 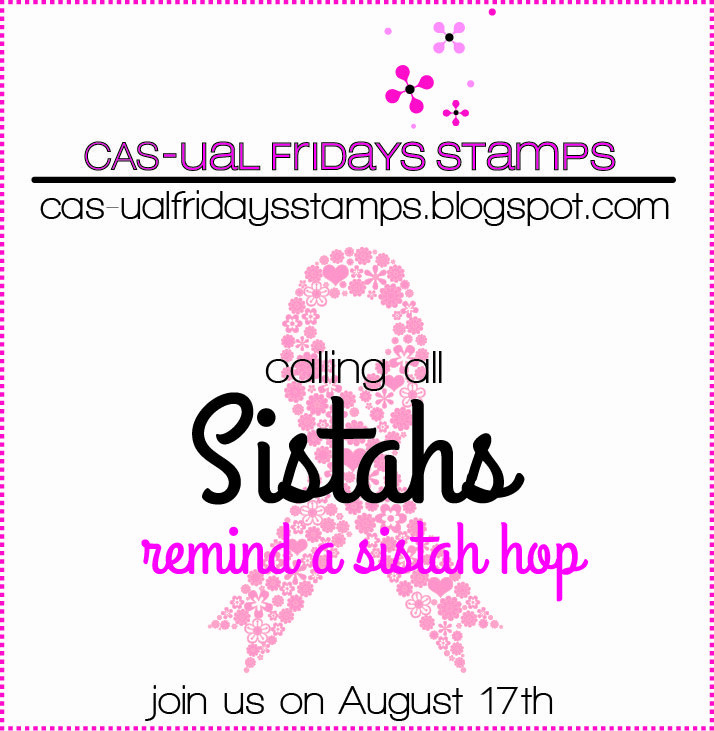 I think it is awesome that you created these wonderful stamps and the Calling All Sistahs Blog Hop to help women find cancer early! It is so important! Thank you for doing this! I also caught cancer early - by the grace of God. It was uterine and could have gone longer if I would not have had good doctors that investigated further where I would have ignored. We can all beat cancer! Thanks for sharing. What your cancer experience has done for other women... Awareness that many might not have known.. Self checks many maybe have not done had you not created this blog hop.. Congrats on being a survivor and saving others lives.. Honored to be a part of the blog hop. Thanks for your monthly reminders! So important to catch it early! Thanks for the reminder and the fabulous blog hop. thanks for the reminder to do an exam.